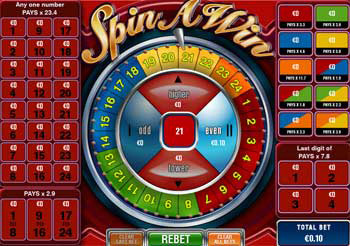 Your objective is to place various bets on where the spinning wheel will stop. Click on the bet areas to increase your bet. Click on Clear Last to cancel the last bet or Clear All to cancel all bets on the table. The amount you have bet on any bet area, is shown on the top of that bet area. Your total stake (sum of all bets for the next round) is displayed on the lower right corner of the screen. Each of the bets has a different payout, written on the corresponding bet area. Any one number - bet on the exact number the wheel will stop on. Range - this area is located in the lower left corner of the screen. There are three ranges: 1 to 8, 9 to 16, 17 to 24. You win, if the wheel stops on a number that is located within the range you bet on. Colors - bet on one or two colors. You win, if the wheel stops on a number of that color. Last digit - bet on the last digit of the spin result. You win if the result has the right last digit. For example, betting on 3 will win if the spin result is 3, 13 or 23. Odd/Even - bet on whether the result is odd or even. Higher/Lower - bet on whether the next result is higher or lower than the previous result. You cannot place this bet on the first spin (since there is no previous result). Also, you cannot place the "higher" bet, if the result is 1, 2 or 24; and you cannot place the "lower" bet if the result is 1, 23 or 24. Both "higher" and "lower" bets lose on a tie (if the result is equal to the previous result). When finished placing bets, click Spin. After the wheel has stopped, your bets will be settled. You can then click Rebet to place the same bets again.